Sheryl Connelly is the in-house futurist for Ford Motor Company. You might be surprised to know she doesn’t ever talk about cars. 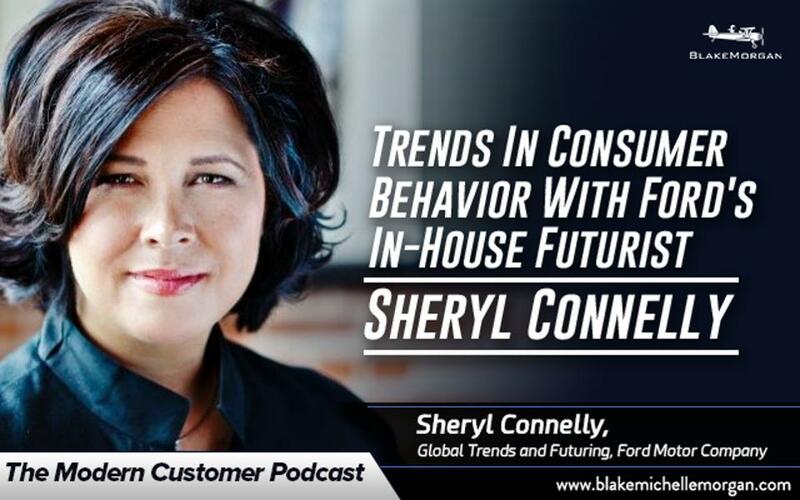 As futurist she says she often finds herself “in the role of the polite contrarian.” If you listen to Sheryl, she’s a wealth of knowledge about self-driving cars, to shifting gender roles, to how and why companies need to work on building trust with consumers. Her job involves playing the role of contrarian. At Ford she spends time asking her colleagues about their own assumptions around their work. And this is the role of the futurist, to pose possibilities and various scenarios around the future and what could be. Technology has sped up the rate of change and this is why the role of the futurist is more important than ever. “The reason we have so many futurists today is we have so much change happening so quickly. I need to put in the opposite vision just so you can entertain it,” said Cheryl. According to Ford the West isn’t ready for self driving cars. The reason might surprise you. Ford did research in eight different countries around self-driving cars. What they found was 84% of people in India and 78% of people in China said they would drive self-driving cars. While in the U.S. only 40% of people said they were ready for self-driving cars, and an even lower number for the U.K. Sheryl said, “We didn’t ask why, but our theory is that China and India have the most egregious congestion takes place, unimaginable for westerners to comprehend. In Beijing the average daily commute can be five hours a day. This isn’t an infrastructure problem since in Beijing they have a highway 50 lanes wide. They suffered a traffic jam that lasted 12 days long.” She believes that this is why in China an India people are ready for self-driving cars. You also have more fatalities because of cars. However the West is a different story. According to Sheryl in the West the car is an extension of personal identity — the car symbolizes freedom and independence. It’s hard to give that up. She noted that autonomous vehicles could add to gridlock. In the podcast we talk about the 2017 Predicting The Future Report released by Ford. The research talks about building customer trust, the rising role of women in society and sustainability. We talk extensively in the podcast about the rising influence of women and Sheryl talks about how she presents these ideas to various teams at Ford. She said, “The rising influence of women is something we pay attention to.” She illustrates to her team members who the rising influence of women impacts society in a variety of ways. “Let me show you how that’s playing out in education, budget planning, board membership and company performance. Let me tell you what women are telling us about our cars. Let me tell you how women are responsible for 80% of household decision making. Let’s look to other arenas for insights that might change the trajectory of our conversation,” said Sheryl. Sheryl is very unique in her role as in-house futurist. You won’t want to miss our conversation on the modern customer podcast. For more from Blake Morgan – customer experience futurist, keynote speaker and author of More Is More – sign up for her weekly newsletter here.